When Mel Gibson’s landmark film The Passion of the Christ released a few years ago, Mike and I heard the buzz. We read the reviews. We watched the film. I did, at least. Gibson’s cinematic treatment of the final twelve hours in the life of Jesus Christ is so profoundly moving that I sat transfixed, tears forming streams of salt down my cheeks. Mike, easily as sensitive as I and far more intimately acquainted with every detail of the Passion narrative, lived the story until the torture began, when he abruptly got up and left the room. They bruised him. They beat him. They bombarded his body with jeers and insults. But they could not break him, because the power of love is stronger still. I knew why my Jesus-loving spouse could not bear to witness the torture of the One he loves more than life itself, even though it was “just” a Hollywood recreation. But I have spent too many decades identifying with His mother. l could no more turn away from the screen than Mary of Nazareth could flee from Golgotha. Too violent, you say? Too hard to watch, too much to bear? Yes, it certainly was. But he bore our sins in his battered flesh. So this is what you can do this year. Pull out your copy of the film, invite your neighbors or small group in and then talk about it. I just learned that the creators of the film have provided a 7 – day devotional study guide companion you can use now or anytime in the months to come. It isn’t just about Him, you know. He’s all about you. The study guide helps you reflect on your own life purpose and how you can use your talents to further God’s kingdom. 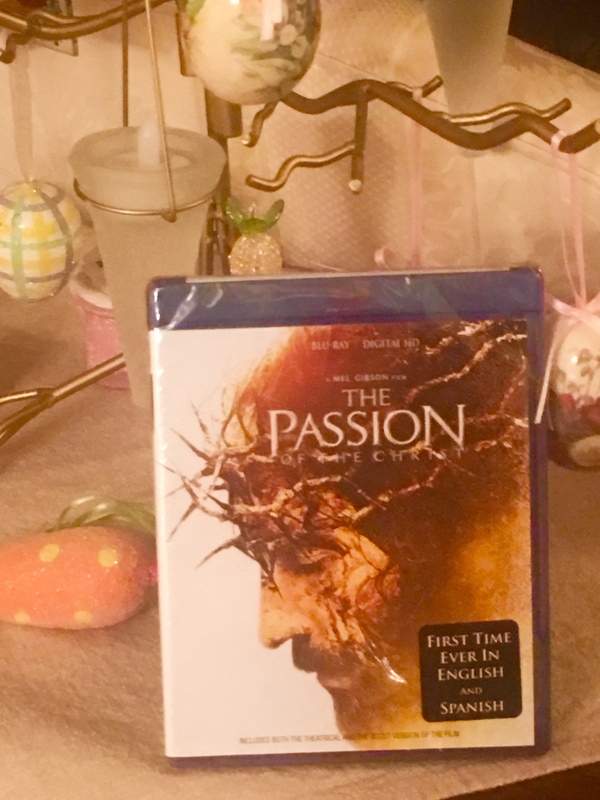 The Passion of the Christ is available in Spanish now, too. Mike and I were just sent a brand-new Blu-Ray Digital HD copy of the film but we already own it. So we want to share it with someone else. You maybe? Your church? If you’d like a free copy, leave a comment below and tell us how you’d like to use it. We’ll select a recipient on Tuesday of Holy Week and mail it that same day so you have it for Resurrection weekend. He loves you. And know what? We do too. Dear Maggie, I love your Tuesday communications! We have seen the movie a couple times but not in awhile. If we are picked, I will probably bring it to Vanuatu with me for Widups to share with people there since they don’t have access to all the resources we have in the U.S.